America's top Street Fighter IV player has shards his thoughts about the new additions coming in the imminent update. Justin Wong, the best Street Fighter IV player in the US, spoke with IGN about his thoughts on the new additions to the SFIV roster. Talking at the 'Fight Club' organized by Capcom in New York yesterday, he weighed in on returning fighter Dee Jay, as well as the brand new Juri, and answered a few questions about Tatsunoko Vs Capcom and Super Smash Brothers. 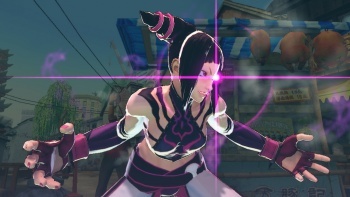 "She's very unique," he said about new Korean fighter Juri, "she's not like any other Street Fighter character that Capcom has ever made ... She has a lot more tricks. She has a purple aura with her moves. She's a fast character but with low life because she's so fast. But other than that I feel like she's a character with a lot of tricks and has one of the prettiest ultras in the game." Justin also got a chance to play as Dee Jay, and felt that he was a better fit in Street Fighter IV than he had been in Street Fighter II: "When he was first released in Super Street Fighter, I didn't like him. But when Street Fighter IV came out, I thought if Dee Jay was in the game he would be a good Street Fighter IV character because the style he had in the other game was as a Street Fighter IV character." Justin also played Tatsunoko Vs Capcom, but while he likes the game, he was unsure that it would ever be a hit on the tournament circuit: "Wii systems are not very tournament-worthy unless it's for Super Smash Bros ...I don't like Super Smash Bros. at all ... Smash Bros. is more like a family game."